Better manage time & projects anytime, anywhere on any device. An end–to–end software for your architectural firm. Time, as well as, expenses are easily lost when managing projects. These costs can add up, eroding the profit margin on any project. That's why architects use Bill4Time. 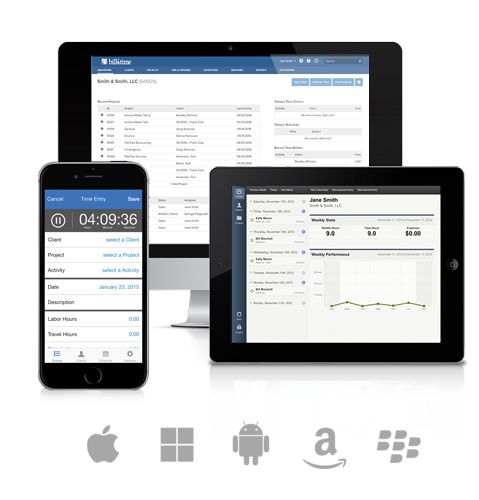 Bill4Time captures every minute and every expense so you can accurately invoice clients. Plus, Bill4Time offers the convenience of online payments so you can get paid faster. Whether you're on the go or in the office, you can account for every minute. Architects lose a considerable portion of their billables due to ineffective time and expense tracking systems. With Bill4Time, you can run multiple timers at once. Automatically add expenses by just taking a photo from your mobile device. It's easy to accurately capture every minute, every cost–in the office or on the go and get paid for what you're worth. Save time invoicing. Bill4Time invoice templates are easy to brand and even easier to use. Save time with custom rates, flat fees. Bill by project or employee. Invoices are easy to read and provide the details clients want, eliminating ambiguity. Integrates seamlessly with QuickBooks. Easily track and manage contacts and projects. Monitor and stay within budget. Store documents directly structured to client or project. Easily integrate with Box.com. Bill4Time offers a wide variety of reports including client summary, internal time, invoices, expenses and more. Run reports on billable and nonbillable time for clients and project. Easily customize your report filters. so you'll be able to better estimate future work by understanding historical records. Anywhere, anytime on any device — iPhone, iPad, Android, BlackBerry. Bill4Time allows my team to work that way with our clients! We provide security services to a broad range of clients and our engineers are on the road non-stop. Bill4Time allows us to immediately and accurately track our time while in the field right on an iPhone. Bill4Time has helped us grow ten-fold. We love it, our clients love it and most of all, my engineers love it as its accurate and simple to use. And, Bill4Time support is amazing. I would highly recommend Bill4Time for any business in need of time, billing and project management.